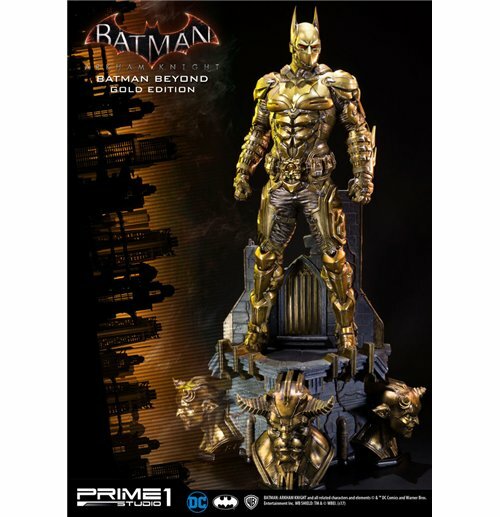 Prime 1 Studio is proud to present MMDC-10GL Batman Beyond Gold Edition from the Batman Arkham Knight. Inspired by the suit of the Batman of the future, Terry McGinnis, from the show Batman: Beyond. Terry was confirmed to take over as Batman after an elderly Bruce Wayne, who is his mentor in this continuity. Statue features: - Size Approximately: 84 cm (Body:66 cm Base:18 cm)- High-Quality translucent resin for a lifelike skin effect- One (1) Alternate Classic Portrait - One (1) Alternate Mouth Armor Portrait - One (1) Switchable Right palm - One (1) Switchable Left palm - One (1) Switchable Right fist - One (1) Switchable Left fist- One (1) Switchable palm for holding Batarang Limited to just 500 pieces worldwide.Please note: Due to the size of this item, additional shipping costs may apply. Apart from your location, the actual package size and weight is needed to determine those costs. Both are unknown at this point and may not be available until the product arrives in our warehouse.